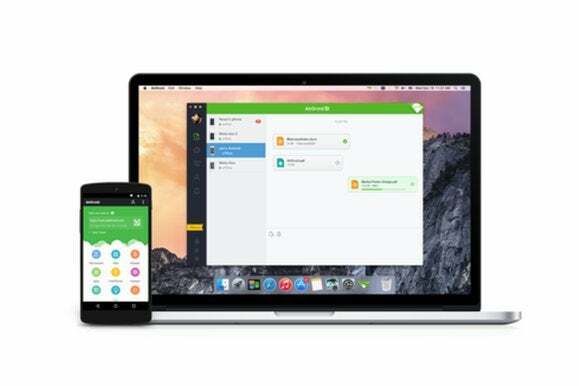 The popular AirDroid utility that blurs the line between your PC and Android phone is finally coming out of the cloud and onto your desktop, with standalone clients for Windows and Mac. The new programs, which are part of AirDroid 3's rollout on Wednesday, means you can get persistent notifications for messages, Android apps, and accept or dismiss phone calls on your desktop—no open browser tab necessary. The new clients also come with a mirroring feature that lets you operate your Android device on your PC, as well as beefed-up security for file transfers. AirDroid 3 promises a lot of improvements. During my time with the service, however, I found a few bugs still to be worked out before the standalone software becomes a true desktop powerhouse, on a par with the service's killer web app. The impact on you at home: AirDroid has always been a great service for getting access to your phone’s SMS app and the file system right from your PC. The new desktop apps for Windows and Mac expand that ability to control your phone from your computer with new features and increased security. 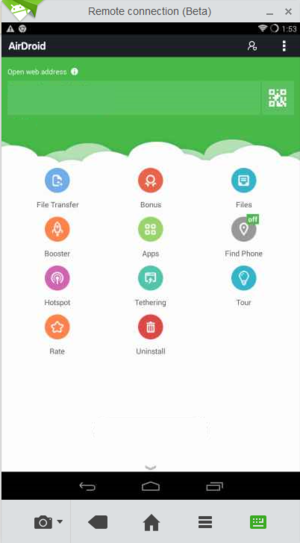 To take advantage of AirDroid 3 you’ll need to sign up for an AirDroid account, which was previously only necessary for enhanced features such as remote device location. Now, however, you’ll need an account before you can even get started with the desktop app. Once you sign in to the PC app, you’ll see many of the features you’re used to seeing on the Web, but with a drastically simplified interface. On the Web you see a slew of various mobile-app-like icons. The desktop client does away with all that, instead using a simple navigation panel on the lefthand side of the app. The panel includes options for sending files to and from your mobile devices; receiving and sending SMS messages; viewing your call log or contact list; viewing app notifications that can be silenced on a per-app basis; and the new mirroring feature. 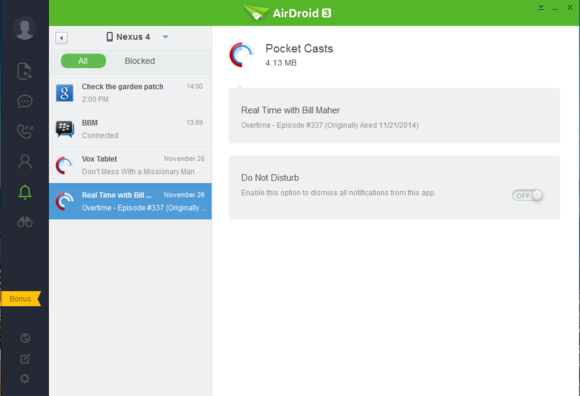 There is also a quick link to the AirDroid web app. AirDroid 3 also brings end-to-end encryption for SMS, app notifications, contact info, and other data sent between your Android devices and the AirDroid desktop app. The company said the encryption feature uses “typical public-key cryptography,” as well as some security technology the company developed in-house. Sand Studio wouldn’t release more detailed technical information, but the company did say it was “confident” third-parties wouldn’t be able to read any encrypted data sent between your Android devices and your PC. The new end-to-end encryption feature is available only on the desktop, and not on the web app. AirDroid lets you silence unimportant app notifications so you don’t see them on your desktop. It’s still early days for the AirDroid desktop app, but in my time it I found the app to be a little inconsistent. 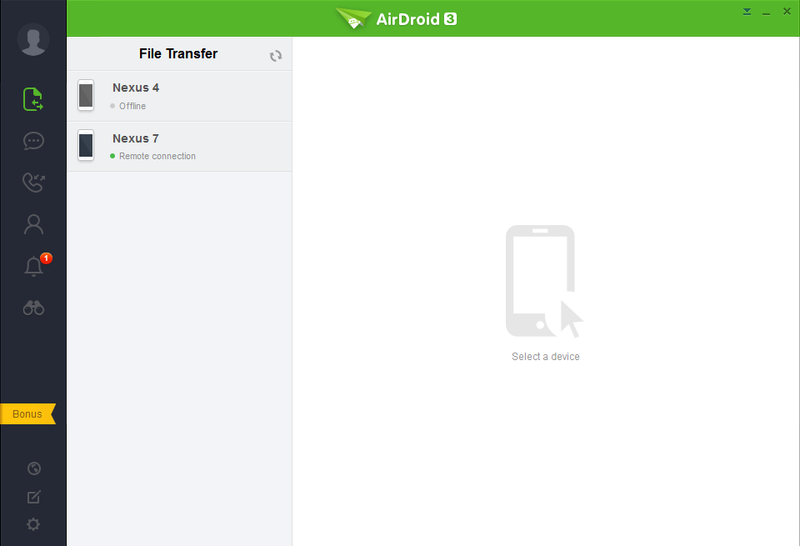 Transferring files between devices—one of the features that made AirDroid a must-have app for me—was problematic. If I used AirDroid 3’s interface to open Windows Explorer to transfer files, the app worked as quickly and efficiently as you’d expect. But simple dragging-and-dropping to transfer files from my desktop to my phone was impossible, while it worked just fine on the web app. The company says the drag-and-drop problem is a known issue that would soon be fixed. The second problem I had was sending text messages. At one point it was working fine on an early beta build, but then it stopped functioning. I could still send texts using the web app, which made this all the more confusing. Sand Studio looked into the issue and said it appeared to be a connection problem possibly related to the company’s network in preparation for the AirDroid 3 launch. In other words, if SMS fails for you on the desktop you should expect to see the feature working again soon. Another feature that didn’t work so well with AirDroid 3 was the ability to accept or dismiss calls on the desktop. Once again, for me the feature didn’t work at all in the standalone software, but I was able to use the new web app to reject a call or reject it with a message. The company says this issue is similar to the SMS problem and I should expect to see it working soon. If you experience similar problems, the company recommends trying to sign out and back in on the desktop and mobile apps. That did nothing for me, but hey, maybe it'll help you. AirDroid 3 allows you to mirror rooted and other select devices on your desktop. One feature that did work well was the new mirroring feature that lets you control your Android device from your PC. For now, mirroring will only work with a few pre-certified phones the company has yet to announce, as well as rooted phones that can give AirDroid super user permissions. The bad news is AirDroid 3 currently does not support Android 5.0 Lollipop—sorry, bleeding edge Android fans. As you can see from the image above, the remote connection to an Android device is a little low-res—or at least it was for me on my Nexus 7 running CyanogenMod. Manipulating the device from the desktop worked just fine however. It was a little laggy, but many remote connection services have this problem. If you’re wondering why you’d want a feature like this, imagine getting a notification for a new message in BlackBerry Messenger or Whatsapp. Clicking the AirDroid 3 notification on your desktop automatically opens a mirroring connection to your phone if available. Once it’s established, you can answer your messages without bothering to grab your handset that could be across the room or in another part of the house or office. To use the new version of AirDroid you’ll have to update your mobile devices to the latest version, which was also released Wednesday.